Struggling Rotherham consigned Brighton to their first away defeat of the season in the Championship. Danny Ward gave the hosts the lead just before half-time as he volleyed in from Joe Mattock's cross. Brighton improved after the break, but Matt Derbyshire increased the Millers' lead by stabbing home from close range. Tomer Hemed hit the post late on for the Seagulls, but the visitors - who slip to sixth in the table - could not find a way past keeper Lee Camp. The result means Rotherham move up to 20th in the Championship table while Brighton have now gone six games without a goal and are winless in eight games in all competitions. The hosts went ahead when Mattock sent in a left-wing cross which had Seagulls defender Lewis Dunk fooled as Ward volleyed from close range. Rotherham doubled their lead late in the second half as Bruno Saltor headed into the path of Derbyshire who easily tapped home from six yards. Brighton came close to finding a consolation when Hemed hit the post from close range, but they could not find a breakthrough. "We deserved it, I don't think anybody could doubt that. "Brighton played their part, but I thought the difference was the front two. I thought the front two were magnificent and they were a real threat for 90 minutes. "The fact that you have got that energy up front helps you defend from the front. It's a long season, we haven't got to look too far ahead, we have got to keep chipping away. "In the second half we gave ourselves opportunities to get back in the game. I think we were well off it in the first half, they got a rhythm. "At the minute, most defensive mistakes we are getting punished for and you can't win football games if you don't score and we are struggling at that. "Arguably there's stuff we're not getting away with at the minute that we were in our good run. We are getting punished for mistakes." Match ends, Rotherham United 2, Brighton and Hove Albion 0. Second Half ends, Rotherham United 2, Brighton and Hove Albion 0. Corner, Brighton and Hove Albion. Conceded by Frazer Richardson. Beram Kayal (Brighton and Hove Albion) hits the left post with a header from the centre of the box. Assisted by Anthony Knockaert following a set piece situation. Attempt saved. Paul Green (Rotherham United) right footed shot from outside the box is saved in the bottom left corner. Corner, Rotherham United. Conceded by Bruno. Goal! Rotherham United 2, Brighton and Hove Albion 0. 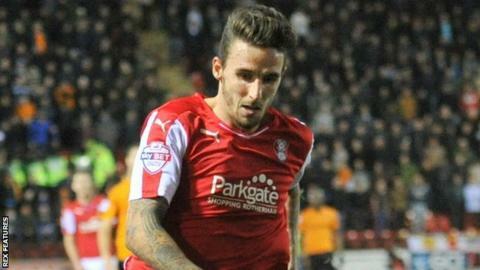 Matt Derbyshire (Rotherham United) right footed shot from the centre of the box to the top left corner. Offside, Brighton and Hove Albion. Anthony Knockaert tries a through ball, but Bobby Zamora is caught offside. Attempt saved. Grant Ward (Rotherham United) right footed shot from outside the box is saved in the top centre of the goal. Assisted by Joe Newell. Substitution, Brighton and Hove Albion. Andrew Crofts replaces Gordon Greer because of an injury. Corner, Brighton and Hove Albion. Conceded by Kirk Broadfoot. Delay in match Gordon Greer (Brighton and Hove Albion) because of an injury. Substitution, Rotherham United. Frazer Richardson replaces Shay Facey. Attempt missed. Bobby Zamora (Brighton and Hove Albion) header from the centre of the box misses to the right. Assisted by Bruno with a cross. Substitution, Brighton and Hove Albion. Kazenga Lua Lua replaces Jamie Murphy. Attempt missed. Bobby Zamora (Brighton and Hove Albion) header from the centre of the box misses to the left. Assisted by Anthony Knockaert. Corner, Brighton and Hove Albion. Conceded by Paul Green. Attempt saved. Anthony Knockaert (Brighton and Hove Albion) left footed shot from outside the box is saved in the top right corner. Attempt saved. Jamie Murphy (Brighton and Hove Albion) right footed shot from the left side of the box is saved in the bottom left corner. Assisted by Bobby Zamora. Delay in match Danny Ward (Rotherham United) because of an injury. Attempt saved. Matt Derbyshire (Rotherham United) right footed shot from the left side of the box is saved in the top centre of the goal. Assisted by Danny Ward.